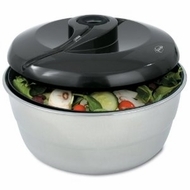 Put a spin on your salad with Fresco’s Stainless Steel Salad Spinner. This retractable pull-cord spinner is easy to use, making it a convenient and effective way to remove moisture from your greens. Removing moisture from your greens is important because they’ll remain green and fresh, longer. Rinse and remove contaminates such as fertilizer, pesticide, dirt and grime. Also, by rinsing and drying your greens, salad dressing will coat your greens evenly and you’ll lose those unsightly and annoying water beads. Make your salad healthier, tastier and more attractive with a simple pull-of-the-cord; with this lovely and durable stainless steel salad spinner. Non-slip base for added stability. Fresco, designed to fit your kitchen and lifestyle.